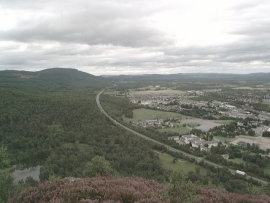 "Aviemore from Craigellachie - geograph.org.uk - 258853" by John G Burns - From geograph.org.uk. 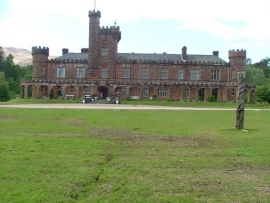 "Kinloch Castle - geograph.org.uk - 181584" by Nigel Homer - From geograph.org.uk. 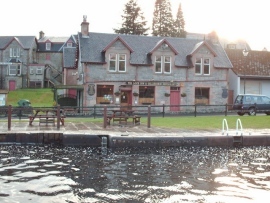 "Refreshments by the canal at Fort Augustus - geograph.org.uk - 1159393" by George Nugent - From geograph.org.uk. 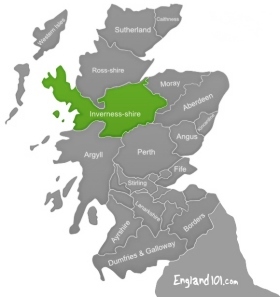 The historic county of Inverness-shire was created in the Middle Ages and then redefined in 1975 as the Scottish Highlands. The Highlands are famous for the Loch Ness Monster, a creature whose existence has never been scientifically documented, but is said to be a large animal inhabiting the Loch Ness area. It was first brought to the world’s attention in 1993, but any evidence (photographs and sonar readings) has since been found to be fake or not definitive. Of course the Highlands offer more than just the mystical Loch Ness Monster –the Falls of Foyers for one is a beautiful place. The woodland walk to the falls is also very scenic, and the trails offer you the choice to see the waterfall from above or below. Urquhart Castle in Loch Ness is also very impressive. The atmospheric ruins overlook the dark and mysterious waters of Loch Ness, and are haunted by a long and bloody history. 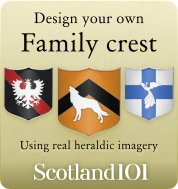 It had a key role in the battle for Scotland’s independence and came under the control of Robert the Bruce before a 150 year power struggle between the Stuart dynasty and the MacDonald Lord of the Isles. 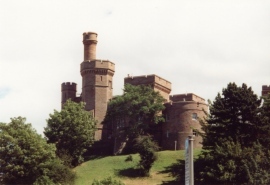 Inverness-shire is also home the historic Culloden; known for the Battle of Culloden in 1746. It was the final part of the Jacobite Rising, which started in 1745. Following the Hanoverian victory, Charles Edward Stuart never made another attempt to restore the House of Stuart or challenge the Hanoverian power in Great Britain, thus it marked the last pitched battle fought on British soil. 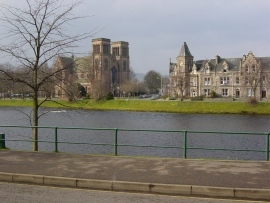 Moving onto the city of Inverness; the River Ness is a peaceful place to visit, and is great for salmon fishing. It cuts through the city centre and so as you stroll along it, you will pass historic buildings such as the Eden Court Theatre, Inverness Sports Centre and Floral Hall/Botanic Gardens. The Botanic Gardens in Inverness was opened in 1993 by Prince Edward and are an oasis of calm based within the city. The gardens showcase lovely flowers, which change during each season. The glasshouses feature everything from tropical rainforest to heat scorched desert succulence. The city is also home to a brilliant Highland Aviation Museum. It houses aircrafts from the past six or seven decades and allows visitors to climb into the cockpits and try on helmets. The operating areas of the Valiant and Nimrod share a glimpse of what is was like during the Cold War.